I’ve been thinking a lot about walking lately. Last week I attended a walking tour of downtown led by PEDS’ Ian Sansom and Dr. Nancy Kropf, GSU’s Associate Dean for Research and Strategic Planning. The other attendees were a mixture of students and professors from Georgia State, local community members, and a planner from the Atlanta Regional Commission. I’m fairly familiar with Downtown Atlanta, but Dr. Kropf and Sansom approached the topic of walkability and urban bicycling from a perspective I don’t usually consider; that is, the perspective of a population that is aging. “Who are going to be out and about in cities in twenty years? Older people,” Dr. Kropf opens as we congregate around Woodruff Park’s Phoenix statue. “They are also the fastest growing group of bicyclists in the region,” she added. This is an important change; just as Millennials are pining for the city, so too are older parents who no longer need all that space in their suburban homes. Both groups are attracted to practically the same amenities: walkable streets, local restaurants and bars just a stroll away, parks and greenspace nearby, and not having to be stuck in suburban traffic for hours on end. The result is a pretty interesting urban dynamic in which young people who haven’t settled down yet (or don’t want to leave the city) live in tandem with these empty-nesters. Which brings us back to the walk on that morning. If more people, especially the elderly, are going to be using city streets for more purposes–walking, biking, taking transit, and driving–then we need to look at infrastructure in a more inclusive way. For the able-bodied, strolling down a typical sidewalk in Downtown Atlanta (or Decatur, or Athens, or anywhere else) isn’t typically much of a problem; but for the older generations, those same spaces can be real challenges. The task of navigating uneven sidewalks or crumbling concrete becomes much more difficult when you add in the aspect of walking with a cane or walker, or when using a wheelchair, or even for families with young children in strollers (which every city that wishes to retain young talent and families should consider). 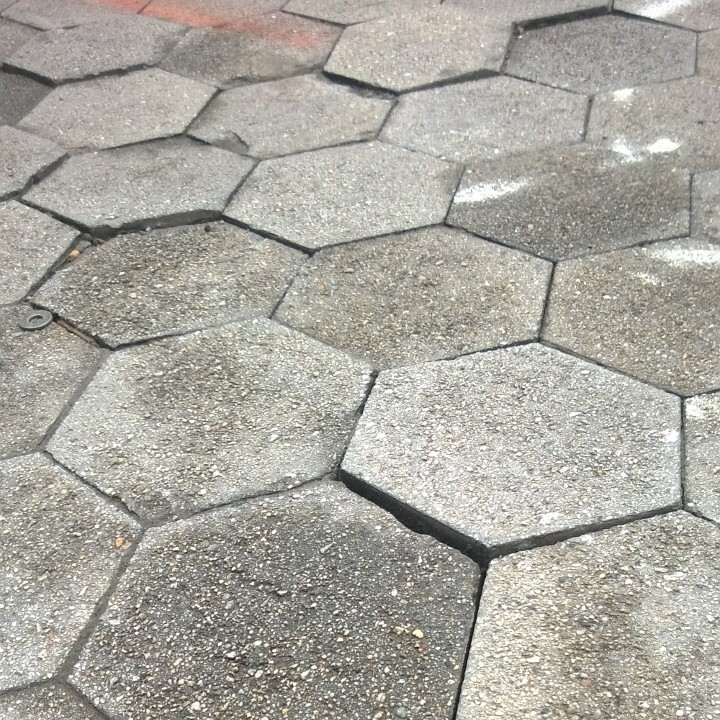 Sidewalk pavers, while aesthetically pleasing, can crumble and cause major problems for sidewalk safety overtime if not properly maintained. Take Downtown Decatur for example. I go to the Café at Cakes & Ale in Downtown Decatur very frequently (it’s kind of a problem). The Café is frequented by people from all walks of life–literally–people walking out of the MARTA station, or walking from the buses, or stopping in off the sidewalk between shops, or jurors on jaunts between court sessions. Needless to say, it’s a pretty popular spot. Multiple times a week, as I work I see people in wheelchairs or young parents with babies in strollers struggle to get in the door, (until usually one of the great staff helps). Yet, they have nearly no problems getting around Decatur thanks to the city’s inclusive and intelligent design around the MARTA station. The Square is surrounded by stairways as well as ramps, making it relatively simple to traverse no matter your ability. It has a bus bay by the train station and parking decks adjacent to it. Regardless if you’re driving, walking, biking, riding the bus, or taking the train, getting in and around Downtown Decatur isn’t a problem. This is the paragon that cities should aspire to, taking different elements of the urban environment and unifying them to create experiences that are open and accessible to all. 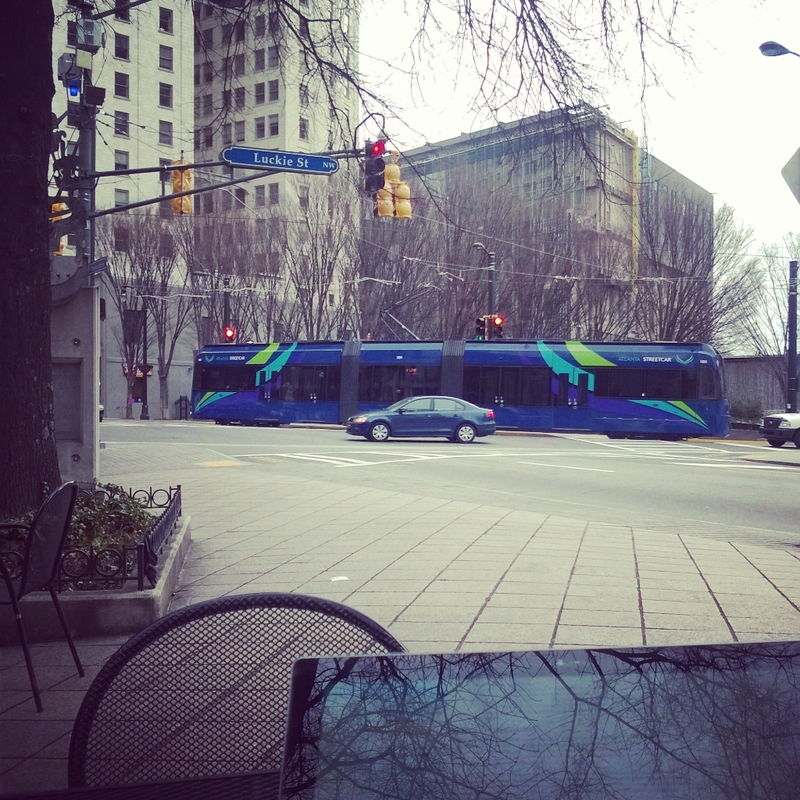 The Atlanta Streetcar rolls on. From what I saw last Tuesday walking down Auburn Ave with my miscellaneous mix of students, professors, community members, and others, I think it’s safe to say that Downtown Atlanta is on its way to establishing a more walkable, more accessible, and more inviting environment for the future. Certainly some spaces remain unfilled, both literally in the course of the sidewalk and in the composition of the city, but the foundation is solid. Access to MARTA in any other part of the region is unparalleled. The Atlanta Streetcar, despite what critics say of its long-term success based on its brief time running, makes it vastly more convenient to get from point A to point B within the neighborhood. 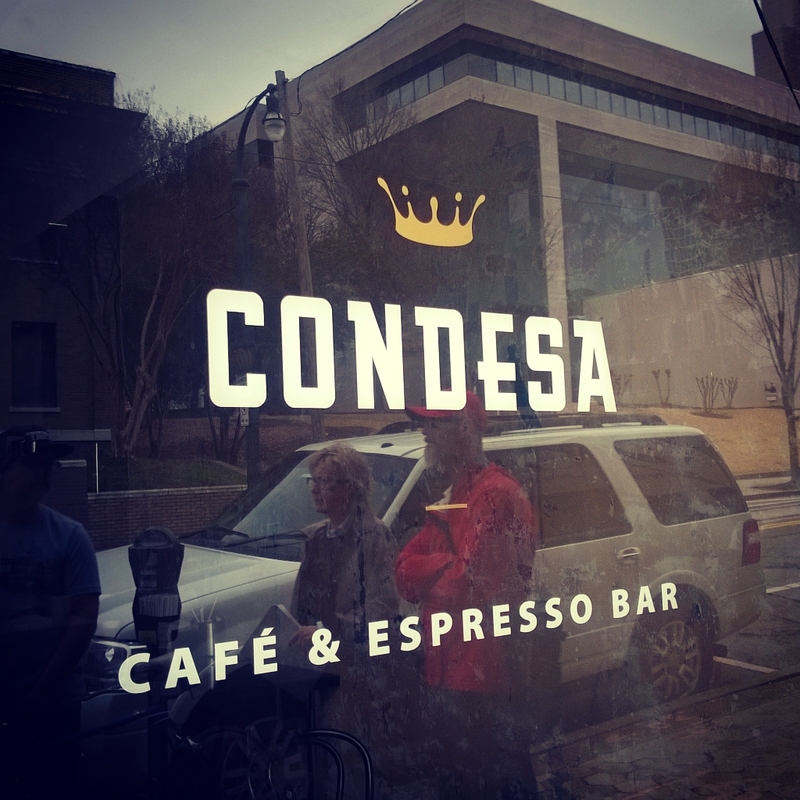 The city’s pop-up shop program and use of tactical urbanism illustrated how vibrant these streets can be, with a few shops staying open after the program ended and more opening, like Condesa Coffee on Auburn Ave and Arden’s Garden in the historic Atlanta Daily World building, bringing new life to the neighborhood. That’s what I think most people miss about Downtown: it’s not just offices and hotels, Downtown is a neighborhood, a historic community that’s looking to and planning for its future. The Atlanta Streetcar is part of that plan, MARTA is part of that plan, the Underground Atlanta redevelopment plan is part of that plan, and the current transportation bond referendum is certainly a part of that plan. 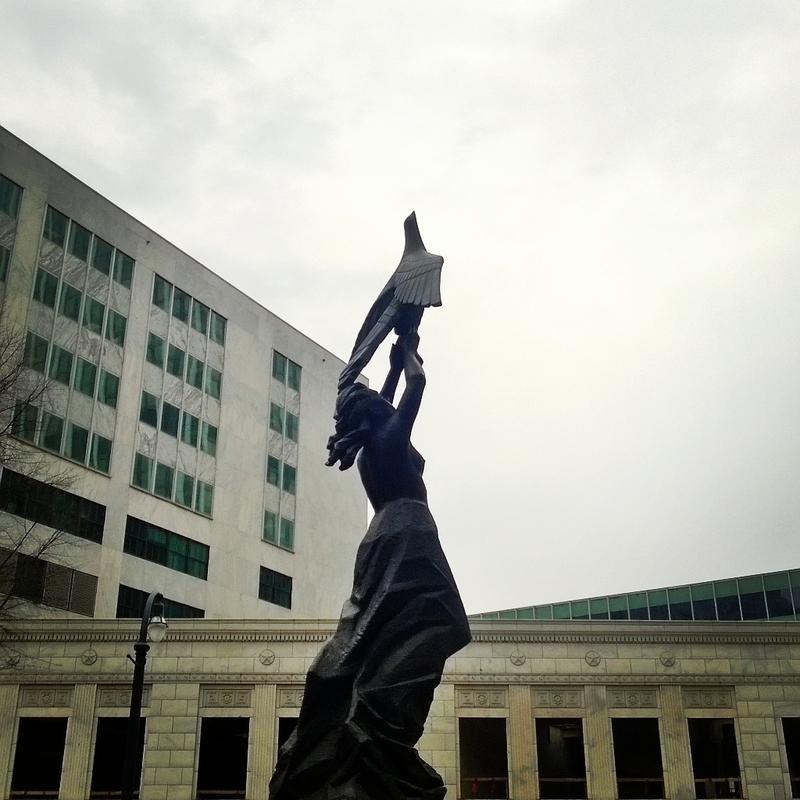 In a city that has historically been divided and segmented, it is refreshing to see the opposite come about. We ended our walk with lunch at the Sweet Auburn Curb Market. This is but another example of how Downtown Atlanta is reapplying relics of the past for future uses. Since reopening a few years ago, it has reached international acclaim as one of the best street markets in the world. It draws people from Grady, Georgia State, and Five Points, students, nurses, and businessmen alike, most of them either walking or riding the Streetcar. This is the paragon that cities should aspire to, taking different elements of the urban environment and unifying them to create experiences that are open and accessible to all. Since I attended Southface’s SART at the beginning of the month, I have reflected on (apparently) how much I walk. Even at an event stocked with people concerned with sustainability, urbanism, and ways of getting around other than by driving, I was surprised when I left to find most of the attendees walking to cars parked behind the building. Granted I stayed a few moments afterwards to chat with old friends, so I surely could not see everyone leaving to hop on their bikes or get a head start ahead of me to MARTA, but when I told a fellow attendee that I walked, he seemed surprised. But the times they are a’changing: people in Atlanta, especially new residents, hate how much they drive, how bad traffic is, and how ineffectual Atlanta’s public transit situation is. They are yearning for the lifestyle that allows them to ride the train home from work or dinner, to walk down the street to the pub, or even just be able to go for a walk and feel safe. If Downtown Atlanta continues to create inclusive streets, develops densely, and supports small businesses as well as the large as it did with the pop-up shop program, it can create a community that is truly compelling for everyone, young and old. 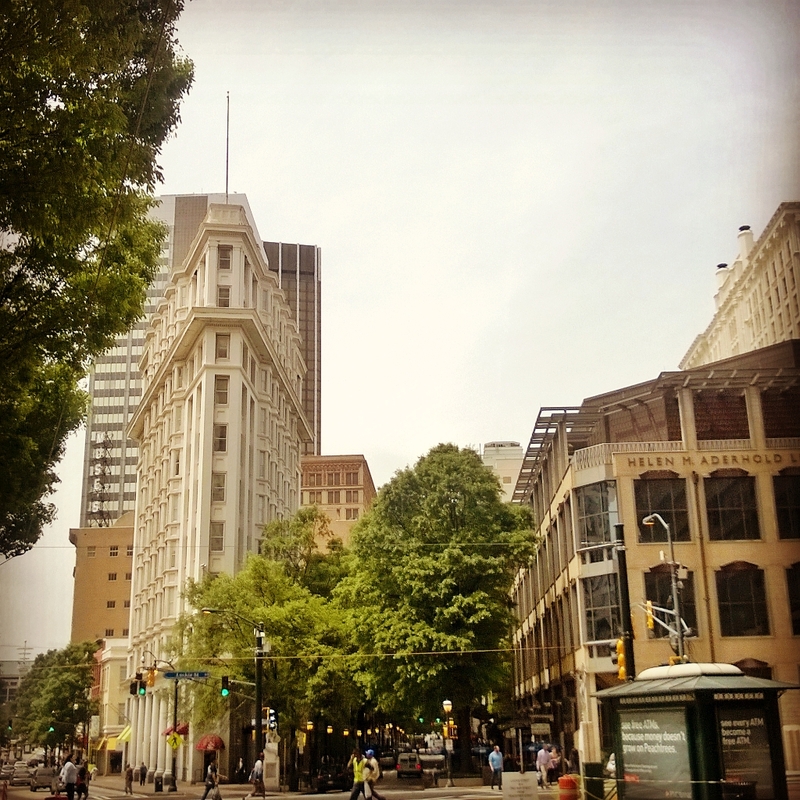 The Flatiron and Broad Street, both bringing new life to Five Points. The foundation’s there, now the gaps just need to be filled in.